Celebrating UK Sausage Week With Sue's Sizzling Sausages! 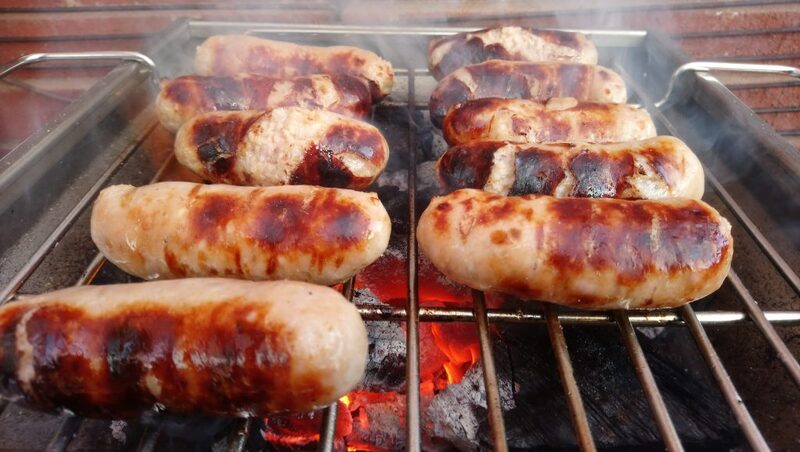 Celebrating UK Sausage Week With Sue’s Sizzling Sausages! Welcome to UK Sausage Week 2018, which runs from October 29th to November 4th. In homage to the great British banger, butchers and sausage lovers will be celebrating by hosting special promotions, tastings and the odd competition. As we write this, the winners of the UK Sausage Week competitions are about to be announced. The categories include best butchers and various classes of sausages, as well as the big daddy, the UK Supreme Sausage Champion!!! Well, we can’t wait to see which sausage merits that accolade, and we’ll see what Mr. Otter Vale can rustle up this week. Master Otter Vale is a huge fan of our local sausages, so watch this space. Check out the UK Sausage Week website here, Like @uksausageweek on Facebook to find out more, and Follow @UKSausageWeek on Twitter to try out the stream of sizzling ideas and recipes. Even better, get down and see what your local butcher is doing to help you enjoy UK Sausage Week – support local! Here in the Otter Vale household we’ve got so many options to enjoy with our sausages. Mrs. 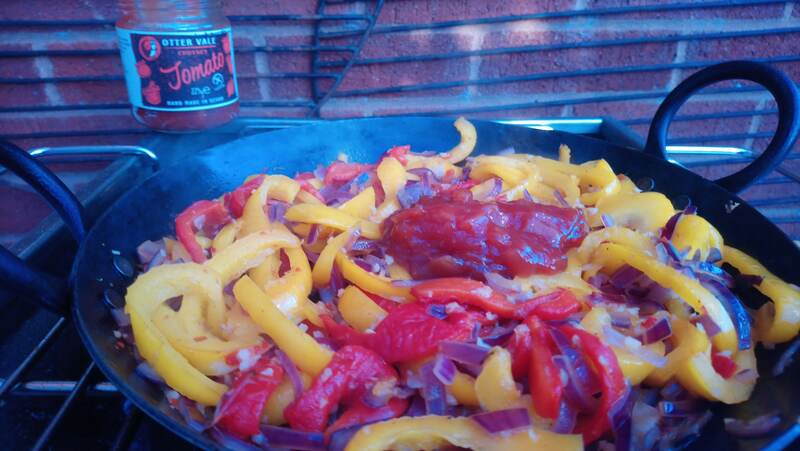 Otter Vale loves our Tomato Chutney with sausages; whilst Mr. 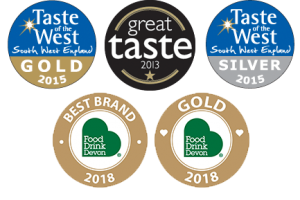 Otter Vale is torn between our Red Pepper Salsa (previously a Taste of the West award winner) or our Great Taste 1 star award winning Apple Chutney with Westcountry Cider alongside pork sausages. We’ve also got a range of mustards for spicing up your sausages. Sometimes, even we think we’ve got too much choice, but at least there should be something to suit everyone! We are very lucky to have another scrumptious recipe from the wonderful Sue Stoneman, a local legend. If you don’t know Sue, she was South West Chef of the Year‘s winner of the Home Cook in 2016 and 2017, has been West Country Baking Champion, Sticky Toffee Pudding Champion, AND is a food writer, and a blogger with Dining Devon. Sue is also renowned as somewhat of an expert on al fresco cooking, both on BBQs and in her own wood-fired oven; as evidenced from the demand for her as a demonstrator throughout the region. Just in case she gets bored, she also has a day job at Big Fire, at The Shops @ Dartington! Sue is a champion of local produce and supporting local producers and retailers, and she comes up with some cracking recipes. 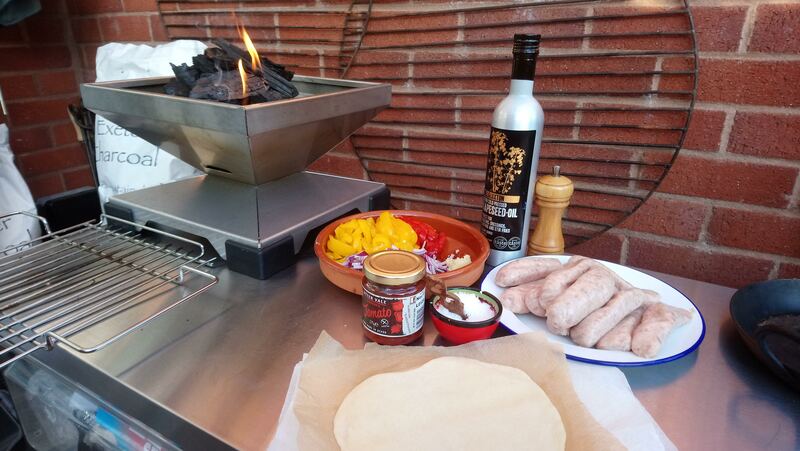 Here, she shares her recipe for barbequed sausages using our Tomato Chutney as part of the relish. Thanks, Sue! Grill the sausages. I like grilling mine on the BBQ as it gives the sausages added flavour. In a pan, put a little rapeseed oil and gently cook the onions until soft. Add in the garlic and chilli followed by the sliced peppers. Cook for about 5 minutes – you want the peppers to still have a bit of a bite. 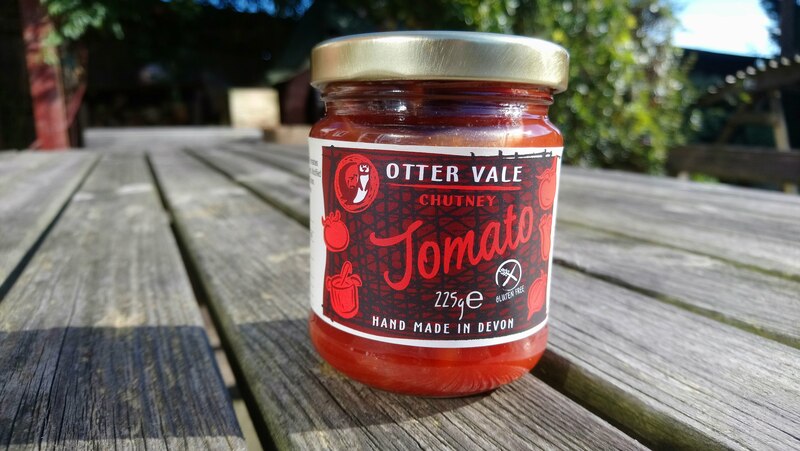 Stir in 3 tablespoons of Otter Vale Tomato Chutney. Serve warm or cold served with a sausage in a roll, with jacket potato, mash or with burgers too. 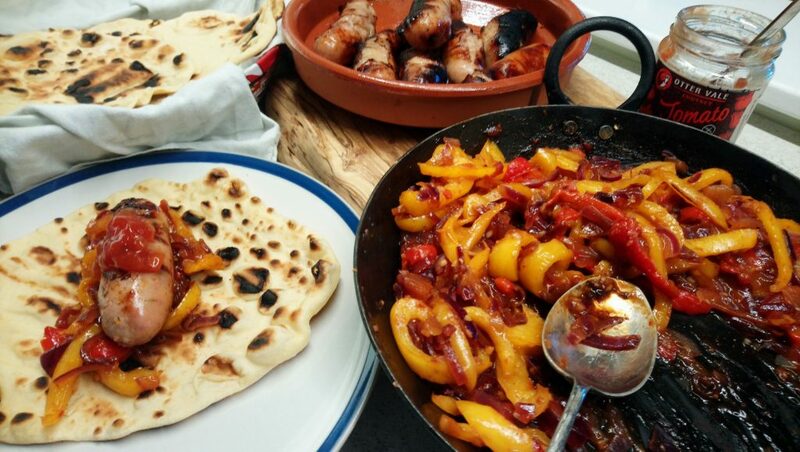 We like to make flatbreads and fill them with the sausage and a big dollop of the relish. You can add another dab of the Tomato Chutney as well. If Mr S can’t wait for me to make the relish, he will dab a spoonful of the Tomato Chutney onto a sausage and gobble it up! It’s a very tasty red sauce on its own. 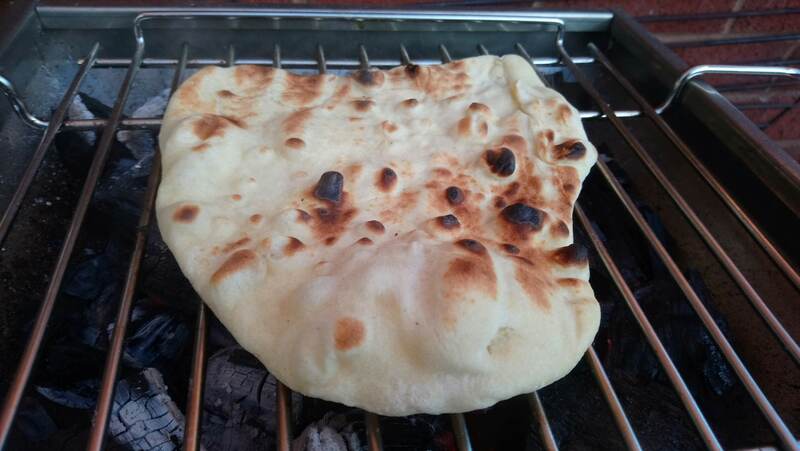 If you would like the flatbread recipe, here it is. This recipe makes 12, and is easily halved. Mix all the ingredients together to form a soft dough (you may not need all of the water). Turn onto a floured surface and knead for five minutes. Put into a bowl covered in tea towel and leave somewhere warm to prove (about an hour). Knock back and divide into 12 pieces. Roll each piece out into a circle and place between parchment paper until ready to cook. Grill directly over coals until start to bubble and colour underneath. Turn over and cook the other side. Wrap in a tea towel to keep warm or put in tinfoil and reheat in the oven when needed.